Where to find Port Hope hotels near an airport? Where can I find hotels in Port Hope that are near tourist attractions? Are you vacationing in Southern Ontario and are after a hotel or apartment in or around Port Hope? There are 4 Expedia-listed apartments and hotels located within a 0.1-kilometre (0.1-mile) distance of its central area. 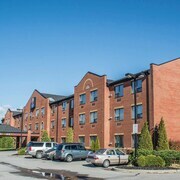 One of only a handful of Port Hope hotels that are close to the center of Port Hope is the Budget Inn Port Hope. The Woodlawn Inn is 16 kilometres (10 miles) from the main part of Port Hope. Alternatively, the Best Western Plus Cobourg Inn & Convention Centre is 14 kilometres (9 miles) away. Two other options are the Comfort Inn Port Hope and the Comfort Inn Cobourg. Like to venture a little further afield? Southern Ontario offers many options. If you're a nature lover, be sure to explore Southern Ontario's beaches, coastal plains, forests and lakes. You could also visit some of the region's traditional villages. Tourists in this part of Canada enjoy skiing, cross-country skiing and snow shoeing. Looking for more things to do? Consider spending a few hours visiting the Northumberland Mall and Victoria Hall in Cobourg, 16 kilometres (10 miles) to the east of Port Hope. The Lotus Motel and Willowmere Bed and Breakfast are some of the great accommodation alternatives in Cobourg. 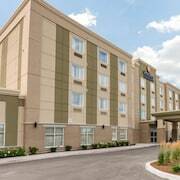 30 kilometres (19 miles) to the west of Port Hope is Bowmanville, home to the Holiday Inn Express Hotel & Suites CLARINGTON - BOWMANVILLE and Best Western Plus Bowmanville. Liberty Bowl and the Bowmanville Zoo are a couple of the most popular points of interest to experience while in Bowmanville. Peterborough can be found 35 kilometres (22 miles) away from Port Hope. While you are there, be sure to visit the Riverview Park and Zoo, Peterborough Lift Lock and the Art Gallery of Peterborough. You might also like to explore the Canadian Canoe Museum and the Kawartha Golf and Country Club. 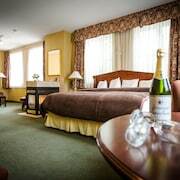 Should you wish to stay in Peterborough, check out the rates and amenities at the Holiday Inn Peterborough-Waterfront, ON and The Woodlawn Inn. Located 110 kilometres (68 miles) away from Port Hope is Pearson International Airport. 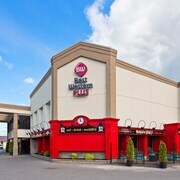 Stay nearby at Sheraton Gateway Hotel In Toronto International Airport or Residence Inn by Marriott Toronto Airport. Bring your camera to Port Hope so you can show your friends a town that stands the test of time. The main streets of town have been preserved to look just like they did when the Ontario community was young. In fact, the community has undergone more restoration and preservation of architecture and historic sites than any other town in Canada. Downtown Port Hope is one of Canada’s best destinations for antiques. Southern Ontario’s weather is greatly influenced by the nearby Great Lakes. Heat stored in the lakes helps to moderate chilly temperatures during fall and winter. Even with this extra helping of warmth, temperatures often stay below freezing for most of the winter. Summertime temperatures tend to linger between 18 degrees Celsius and 27 degrees Celsius. Spring and fall offer exceptionally mild and pleasant weather for your sweet little holiday. With so much beauty in every season, it’s easy to see why inns and hotels in Port Hope are such popular spots for couples and families. Get ready to pack your itinerary full of gems. The fun can start at the Canadian Fire Fighters Museum, the Northumberland Rock and Roll Experience, and Capitol Theatre. Enjoy fresh air and unforgettable adventures at Ganaraska Forest and the Port Hope Conservation Area. You’ll be happy to know that we have fresh deals at Port Hope, Ontario hotels near all these great attractions. You can grab cheap rates to make your upcoming holiday the greatest trip of your life right here at Expedia.ca. Ready to stretch every dollar you spend in this glorious little slice of Canada? It’s time to combine your overnight accommodations with flights to Port Hope. We have all-inclusive packages that are perfect for any individual or family travelling on a budget. Speak with our travel experts to learn how to see more attractions for less money. It's time to book a little time in Ontario with amazing offers from Expedia. What are the most popular Port Hope hotels? 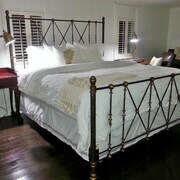 Are there hotels in other cities near Port Hope? 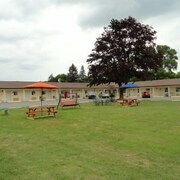 What other types of accommodations are available in Port Hope? Explore Port Hope with Expedia.ca’s Travel Guides to find the best flights, cars, holiday packages and more!